Thank you for sending me your consent to continue to send you information about my current exhibitions and other art events per the new Canadian Anti-Spam Legislation. At any time if you which to be taking off this list just send me a quick note privately and I will take you off the list. Give a gift for the creative on your list. Claudette had a busy and productive 2014 starting with the Ontario Government purchasing her painting "Night Vision #3" from the Art Gallery of Burlington Art shop. Then she was accepted and participated in 3 Outdoor Art Shows inlcuding the Toronto Outdoor Art Show, Queen West Crawl, and Oakville Art in The Park, plus one indoor Art Show over the border In Echo Art Show in Buffalo NY with juror from the Albright Knox Art Gallery. She started painting little 8X10 city scape paintings in May and sold 3 at the Echo Art Fair. To top this 2014 off two of Claudette's paintings were selected in contest ‘UP Your Alley’ public art call out of 27 total submissions for outdoor digitized wall mural in International Village East End area. The art will be produced onto aluminum panels and exhibited in the International Village Business Improvement Area (BIA) on the walls on the street. She had a solo show of her city scapes at new gallery on James Art @231 plus a member group showing at the Hamiltan Artists Inc in the fall. Her painting "Chasing" was selected for show in Palermo Italy in 2015. Claudette's new painting "Chasing" is now at the 2nd Biennale of Palermo Painting and Sculpture Art Contest and Show in Parlermo, Italy, January 2015. For more information and see the art works go to: www.biennaledipalermo.it. This painting is exhibited at Palazzo Sant'Elia, and the inauguration will take place on January 11 at 5:30 pm. Claudette's paintings that were selected in the Hamilton City Up Your Alley Contest are now up in digital form on aluminum panels one at 307 King St. East and the other at 259 King St. East as of January 16th. Go check them out! Claudette's art has been accepted in the Love Art April 16th to 19th 2015 at the Heritage Court, Direct Energy Center, in Toronto. She will be in shared booth with other members of the Toronto Artist Network. Love Art is the sister fair of global brand Affordable Art Fair. The concept is simple, yet unique: an inspiring and friendly atmosphere in which you can find thousands of paintings, original artist-made prints, sculptures and photographs all under one roof, ranging from $100-$10,000, with more than half priced under $5,000. The work of young, emerging artists hangs alongside some of the biggest household names, while our Recent Graduates Exhibition provides a chance to snap up work by a future art world star. Some of Claudette's City Scape paintings plus some transfer art will continue to show at the new gallery on James Street North called art@231 for the month of December with Lesley Cordero's non objective abstract paintings and other artists participating in the christmas show. Come out during the month or the next James Street North art crawl on January 9th 7 to 11 pm to see her new paintings not yet seen on James plus a few older paintings! For more information: www.artat231.com. Claudette has her art up on James Street at art@231, Humblepie, Blue Angel and Centre3. Come out any time during regular hours to check out what is new. The next James Street Crawl art night is February 13th 7 to 11 pm. Claudette has two of her paintings in the Fall/Winter Art Magazine by The Elaine Fleck Gallery in Toronto: http://www.elainefleckgallery.com/fall-winter-2014.pdf. She was also in the Spring/Summer edition: http://elainefleckgallery.com/spring-summer-2014.pdf. She had her new floral acrylic painting "Be Still #2" for the group show at the Elaine Fleck Gallery in Toronto in December at 888 Queen Street West. Claudette's painting "Busy Intersection was selected by Dundas Valley School of Art for their Artists' Connection 4 Program 2015. The art works will travel through the Hamilton Wentworth School Board for the next 3 years. Gorgeous one-of-a-kind, all-over-printed front and back t-shirts created by you. Now you can order t-shirts from my See Me web site with one of my paintings on it for $32 plus shipping charges. I made a t-shirt of the No Left Turn painting: https://losier.see.me/post/2654581?tab=tshirt. You can follow this link to make your own t-shirt or click on any image to turn it into a tshirt or postcard by going to my https://losier.see.me/. We aim to print and ship your custom shirt within five to seven days of your order. Shipping costs will be added at checkout based on your shipping address. Claudette's painting of Lotus called “Be Still” was accepted for a Multi-Faith 2015 Calender as in Inset image produced in British Columbia that is currently out for 2015. They can be purchased. Come support my new business! I've started hosting 2-hour social painting parties with Cocktails 'n Canvas at local restaurants and lounges. Come try something different and best part is, no experience is necessary. You will get to drink, create, connect and socialize while I provide step-by-step instructions on creating your own masterpiece. Click here to see the paintings www.cocktailsncanvas.com This is a great way to relax and unwind and be creatively social! Wednesdays, January 28 to March 11; 9:30 a.m. to noon at RBG Centre. Learning to sketch is a practical value of not only the skill for drawing, but it makes you observe and compare proportions of objects. Your focus on these objects, without the distraction of colour, will allow you to store information; a visual reference to pull from once colour is applies. Claudette Losier will outline the concept of thumbnail sketches, composition and cropping for watercolour painting. This a great program for beginners and intermediate levels. Wednesdays, January 28 to March 11; 1 to 3:30 p.m. at RBG Centre. MAXIMUM 15. PRE-REGISTER BY JANUARY 18. Join our new teacher as she demonstrates techniques for painting landscapes. Artist, Claudette Losier will explain the basic elements of how to paint rocks, skies, trees, foliage and water. Learn and practice these tips during this eight-week course. Discover the beauty of landscape painting. Geared to beginners and intermediate painters. Claudette's booth at the 2014 Toronto Outdoor Art Show got the attention of passer by student of University of Toronto Emily Katz who included a write up about the art on display. The arcticle is called “Sunglasses at the Art Gallery” published July 10th 2014 in the UofT school paper thevarsity.ca. She wrote of Claudette's work: By contrast, Claudette Losier’s acrylic paintings breathe vibrancy and life into the often grey cityscape of Toronto. Most often, she paints night scenes, yet her color palette is comprised primarily of neon. She draws from her background of painting florals to influence her recent, entirely urban work. Claudette has been displaying her art in the Elaine Fleck Gallery's Spring and Fall catalog since 2010 and in the new 2014 Spring/Summer and Fall/Winter Art Magazine. For more information go to: www.elainefleckgallery.com. Claudette's art has been reproduce in article in DY Magazine's Sept/Oct issue in digital on line format. You can check out their website: thedymag.com . See the Sept/Oct Edition at:http://issuu.com/damonyoumans/docs/thedymag.com?mode=window&backgroundColor=%23222222. DY Magazine serves the intellectual aspects of life through art, literature and politics. Claudette has a new web site at: http://www.artisticallyconnected.com/user/claudette-losier. This web site wrote up article on my art that is being featured by e-news at the following link: http://www.artisticallyconnected.com/claudette-losier-0. Claudette won the City of Toronto Purchase Award 2011 for “CinderPoppy” oil transfer painting at Scarborough's Arts April 2011 Juried show. In 2010 Claudette's transfer mixed media piece called "Noodling My Doodling With Thy Neighbour" won an honourable mention in 4th NeoPopRealism Starz Int'l Art Competition. You can check out the winners at: http://neopoprealismjournal.wetpaint.com and http://wonderpedia.wetpaint.com - NeoPopRealism Journal & Wonderpedia links. 2013 – International award of Honorary Mention for “I'm On Fire Burning With Desire” acrylic painting with Artavia's on line contest for a booth in LA Fall 2014 Art Fair. In the past she has won awards in Juried Shows in Ontario one award of merit for her swimmer drawing, honorary mention for transfer work, a Gerald Gunter Humanity Award, and two best in show awards for my mixed media portraiture work. In August 2014 2 of Claudette's paintings "Downtown Gates" and "Coming and Going Around East End" were selected as digital wall mural's for King Street East End in the International Village area. Her art works are being sold at the Burlington Art Centre Art Ectera shop, the Art Gallery of Hamilton’s Art Rental and Shop, Centre3 Print Studio Boutique, Blue Angel, Art@231 Gallery on James Street North, and Humblepie. ​Claudette's show Sense of Place city scape art at the Murberry Coffee House at 193 James Street North for the month of the November 2016 has been extended for the month of December! The James Street North Art Crawl is on December 9th 7 to 11 pm. Hope to see you there! Hamilton Inc's Annual Membership “Swarm” Show is up at 155 James Street North and the opening was last Saturday. My little painting “Taking a Break” was sold that night! The show will be up till January and available to see on December 9th James Street Art Crawl. Centre3 is also having its Annual Membership “Small is Good” Show with everything $200 and under at 173 James Street North. They will be open for the December 9th James Street Art Crawl 7 to 11 pm. Claudette has 5 12X12 Square paintings in Julia Veenstra's Square Foot Show in her studio gallery at 167 James Street North. The preview night is December 7th from 7 to 10 pm and sold out! There may not be many paintings left for the December 9th art crawl! Claudette has her art up on James Street at art@231 and will be part of John's December artists group show. Come out any time during regular hours to check out what is new on her walls. The next James Street event is December 9th 2016. Hope to see you out! Claudette's art is also showing at Sealed Art at 89 Gage Avenue South in Hamilton. Claudette's Sense of Place city scape art will be displayed at the First Unitarian Church of Hamilton at 170 Dandurn Street South in Hamilton from September to October 2017. Claudette's art has been accepted in Inspiration: International Art Book 2016. Check out my on line gallery: #http://artbook.gallery/claudette.losier. They had a booth as an official media partner for the book "Inspirational Art Book" that I am featured in at the NY Art Expo 2016 April 14th to Sunday 17th at Pier 94, 711 12th Avenue, NY. NEW! DoTERRA Essential Oils Wellness Advocate to promote wellness and natural health benefits from doTERRA pure essential oils. Claudette took the DoTERRA AromaTouch February 6th 2016 course and can now give treatments to balance clients chakras with essential oils. Check out my website: http://mydoterra.com/claudettelosier. New! Max International The Glutathione Company – Max Associate to promote wellness through RiboCeine new technology. We dont treat, cure, prevent or diagnose, but we do increase glutathione which is a precurser to good health. Check out my website: https://www.max.com/max/624917/ca/en. Biennale of Palermo Painting and Sculpture Art Show in Parlermo, Italy, January 2015. For more information: www.biennaledipalermo.it. New: Claudette was accepted into the Echo Art Fair in Buffalo, New York, September 6th and 7th 2014! For more information: www.echoartfair.com. New: Claudette was accepted into the 2014 Toronto Outdoor Art Show that is held at the Nathan Philip Square in Toronto July 4 to 6th. She will be displaying her body of work called “Sense of Place” of city urban scape paintings that is in the style of Semi Abstract Surreal Impressionism Socialism. Check for artists lists and booth location later on their site: www.torontooutdoorart.org. NEW: Claudette was accepted into the 2014 Queen West Art Crawl in Toronto taking place in Trinity-Bellwoods Park on September 13 and 14, 2014. For more info see: www.queenwestartcrawl.com. New: Claudette was accepted into the Oakville Art in the Park for second time being held on Monday August 4th 2014. For more information: 905 827 5711, info@oakvilleartsociety.com, www.artintheparkoakville.com, and www.oakvilleartsociety.com. Claudette will be exhibing her city urban scape art work at Art Square Gallery across from the AGO in Toronto from July 11 to August 8th 2014 with fellow Artists Leslie Cordova and Bev Sneath. Claudette will be exhibing her city urban scape art work at the Hamilton Artists Inc members' space in October/November 2014 with fellow Artists Leslie Cordova and Callie Archer. Claudette's painting of Lotus called “Be Still” was accepted for a Multi-Faith Calender as in Inset image produced in British Columbia that will be out in 2015. Claudette has been displaying her art in the Elaine Fleck Gallery's Spring and Fall catalog since 2010. For more information go to: www.elainefleckgallery.com. In the past she has won awards in Juried Shows in Ontario one award of merit for her swimmer drawing, honorary mention for transfer work, a Gerald Gunter Humanity Award, and two best in show awards for my mixed media portraiture work. Her art works are being sold at the Burlington Art Centre Art Ectera shop, the Art Gallery of Hamilton’s Art Rental and Shop, the Glenhyrst Art Gallery Rental and Sale Shop, the Centre3 Print Studio Boutique and the Artists Walk in Burlington Shop. In 2006 she turned her attention to teaching art with classes in oil painting, drawing botanical and wildlife subject matter, and transfer art techniques at the Burlington Art Center, and the Royal Botanical Gardens in Burlington. The Ontario Archives has purchased two more pieces of artwork from the Burlington Art Centre Art Sales and Rental collection. Claudette Losier’s “Night Vision” has been purchased by the province as part of its permanent collection. The work purchased this time was by Marc L. Gagnon and Claudette Losier. Ms Losier recently won a prestigious award. Marc L. Gagnon did “Horizons” which is also now part of the provinces permanent collection. This is the second occasion for such a purchase. The Ontario Archives has built a state of the art facility to temporarily house the artworks before they begin their journey to municipal offices throughout Ontario. The artists are paid 55% of the selling price, BAC gets 45%. Net revenue goes to the BAC, to help support programs and services. You can view Losier's art on the following sites: https://loiser.see.me, www.absolutearts.com/losier, www.flickr.com/photos/30736118@N03/, www.facebook.com/people/claudette-losier/721706268, and www.artisticallyconnected.com/claudette-losier. Give a gift for the creative on your list. Claudette has her art up on James Street at Humblepie, Hamilton Art Store, Centre3, and Lister Arts at Lister Block. Come out this Friday March 14th for the James Street Art Crawl and check out my art on the street. I will be at Lister Arts all day on the 14th from 11 to 7 then later at Humblepie. Claudette's paintings 'Night Vision #2' & 'Long Way Up' are on display at the St. Catharines TagArt Gallery for the Winter '14 Group show, in the main-floor gallery. Also still on display are the cityscape 'transfer-art' pieces & the pins & magnets are in a jewellery-display case. The show runs from April 2nd to May 10th. The gallery is at 214 King St., St. Catharines. For more info: call 905-682-5072 or Toll Free: 1-877-682-5072 or http://www.tagartgallery.ca/. Claudette's city scape paintings “Strolling in the Stillness” and “Around the Bend” was just accepted in the Women's Art Association of Hamilton's 118th Annual Juried Show at the Art Gallery of Hamilton. The show is up from March 4th till April 27th with opening reception on Sunday March 16th, 2 to 5 pm. Claudette will be exhibiting her florals at the Burlington Art Centre in the Lee-Chin Family Gallery from April 12th to June 1st 2014 with 3 other local artists and curated by Denis Longchamps. The show is called “In The Garden” and you are invited to participate in a Haiku Poetry Contest. Winners will have their haiku poems published in the exhibition catalogue which will be launched at the closing reception. Come and sit in our garden and become inspired by the art of Victoria Pearce, Claudette Losier, Wayne Moore and Susan Rankin. To participate in the contest, visit the In the Garden exhibition beginning April 12, 2014, and write a haiku inspired by the show. Then submit your haiku before April 30, 2014. The opening reception is on Sunday April 13th from 2 to 4 pm and Artist Talk on Sunday April 27th at 2 pm. 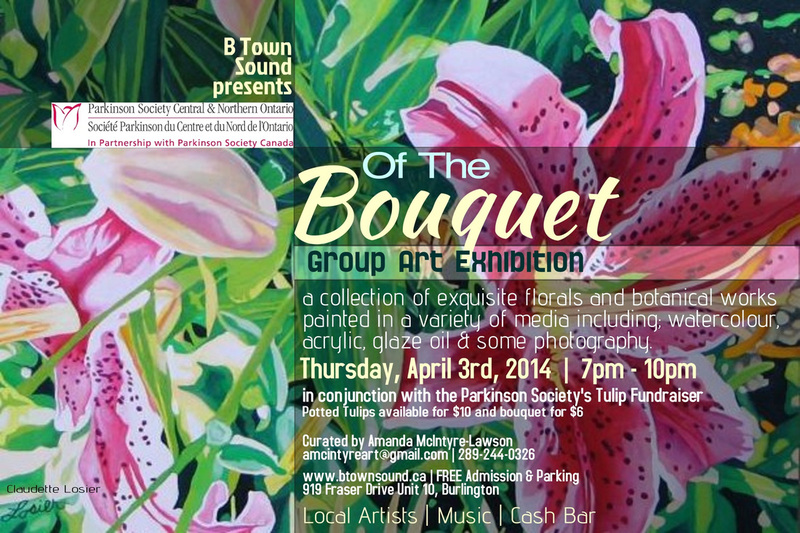 Claudette will be exhibiting her florals in group show called “Out of the Bouquet” in Burlington at B Town Sound at 919 Fraser Drive unit 10 in Burlington. There will be open reception on Thursday April 3rd 7 to 10 in conjunction with the Parkinson's Society Tulip fundraiser with potted tulips for $10 and bouquet for $6. Come out to get your tulips and floral art. For more information contact: www.btownsounds.ca or amcintyreart@gmailc.om or 289 244 0326. This exhibition runs till April 20th. Claudette will be the feature artist exhibiting her florals “Where Beauty Lies...” at Jordan Art Gallery in April. The Jordan Gallery is located right beside Cave Spring Cellars, in the heart of Jordan Village. For more information contact: www.jordanartgallery.com or 905 562 6680. The transfer technique is a form of photo based mono printing or mark making with an abandonment to chance working your intuition. You can never recreate the same mark or image. In the workshop you will learn the basic transfer technique as a base for process art that could be added with other methods such as collage, encaustic, coffee for staining, applications for furniture restorations, etc. The students will start with the toner photo copy and applying with the polymer emulsion method up to 10 layers then soak the back of the copy and remove the white paper leaving the toner sticking on the polymer which becomes a clear plastic film when it is dry. The film then will be applied on a support and then coloured up using various inks, chalks, and other pigments or objects. The main focus will be on providing one on one assistance to participants throughout the workshop. Supply list given to participants prior to class. Contact Claudette if interested at 905 388 7794 or claudette.losier@hotmail.com. Claudette Losier the model will be offering 3 hour sessions of an animation life drawing session which means no poses longer than 10 minutes. She will start with 30 second poses, then 1 minute poses up to 10 minute poses, and repeat for another set of same timed poses. Claudette will start these once a month sessions starting Tuesday March 18th from 6 to 9 at Humblepie so check Humblepie for dates. Humblepie will supply the space and chairs but does not have any easels so students will have to bring their own plus their drawing materials. The charge will be $13 per person to be paid before the class with minimum of 6 students for the class to run. Contact Claudette if interested at 905 388 7794 or claudette.losier@hotmail.com. Claudette will also bring in art books on life drawing and some of her sketches.